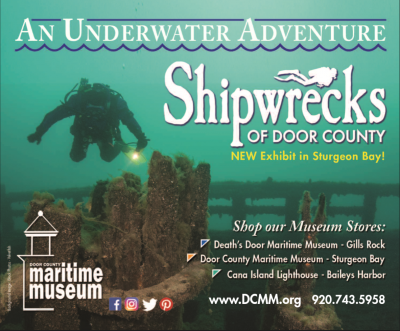 In May 2018, the Door County Maritime Museum debuted our newest exhibit in the Horton Gallery, Shipwrecks of Door County. The exhibit explores maritime life on the Great Lakes and the inherent dangers that throughout history have sent scores of ships to a watery grave. The exhibit engages the senses while educating and entertaining through the use of recovered shipwreck artifacts, rare historical photos and underwater shipwreck video footage, as well as through interactive learning and immersive environments. The exhibit provides a greater understanding of what the men and women on the Great Lakes endured and sacrificed as they helped forge our maritime history. There are more than 275 shipwrecks in the waters of Door County and many of those are in less than 60 feet of water. There are ancient schooners and modern steamers, all at the lake bottom. The cold waters of Lake Michigan do an amazing job of preserving these wrecks. The science of how frigid water preserves wrecks and how divers deal with the cold and the depths can be explored. Life at sea is inherently dangerous and tragically ships are lost. As an institution of local learning and discovery, Door County Maritime Museum looks into the past by using these lost vessels as a window into our area’s rich maritime history and the science behind excavating artifacts which, ultimately, will foster an appreciation for the natural beauty, distinctive history, and open underwater spaces of Door County. Visitors are first greeted by an introduction to the exhibit and a display on the evolution of underwater diving from its dangerous ancient roots to the modern technological wonders of today. Learn the basic detective work of underwater archeology. Next, guests are able to safely experience a harrowing journey of a wooden schooner trying to make safe harbor through a storm. Unfortunately, it is hard to see the lighthouse in the distance off the port bow. Suddenly, there are hidden shoals, the vessel begins taking on water, and crewmembers helplessly watch as the vessel ultimately comes to rest on the lake bottom. As visitors exit the simulator, they emerge on the floor of Lake Michigan. In an immersive underwater world, guests are greeted with exhibits mimicking pieces of the shipwrecked schooner that highlight how the environment works and encouraging them to discover more about how the rapid progression of time can affect the very vessel that they went down on. Exhibits guests come face to face with the remains of that shipwreck, now a century past. This reconstruction will be modeled after a historic shipwreck, the name of which will be revealed upon careful investigation, and will reflect the history of that vessel and all elements that went into its construction, fostering an appreciation for not only the ship itself, but the role of those who built it. Climate controlled cases showcase real shipwreck artifacts built into the “wreck”. Shipping cargo by water is an ancient, and still widely used, means of transporting large amounts of goods. For Door County and many other communities on the water, it was the primary means by which commerce took place. While economical, it wasn’t without risk as the many shipwrecks still laden with goods can attest. An interactive touchscreen will explore the science of buoyancy and ship cargo. Continuing visitors will come to a large interactive map of the Door Peninsula showcasing several shipwreck locations. Giving the larger story of maritime trade, loss, and subsequent archeological discovery, guests will be able to choose their favorite ships and learn more about the county’s underwater heritage. This map segues into how these wrecks are found with increasing technical accuracy. More screens will show LIDAR, SONAR, ROVs, and drones in action while interpretive text will briefly describe how these operate. Finally, visitors will come upon an enclosed space, darker and lit by the light from a panel of stained glass. Contemplation and discussion will allow for a peaceful end to the Shipwrecks of Door County experience. Here we present even more shipwreck artifacts, but more importantly, personal ones which showcase the human cost of these maritime tragedies. 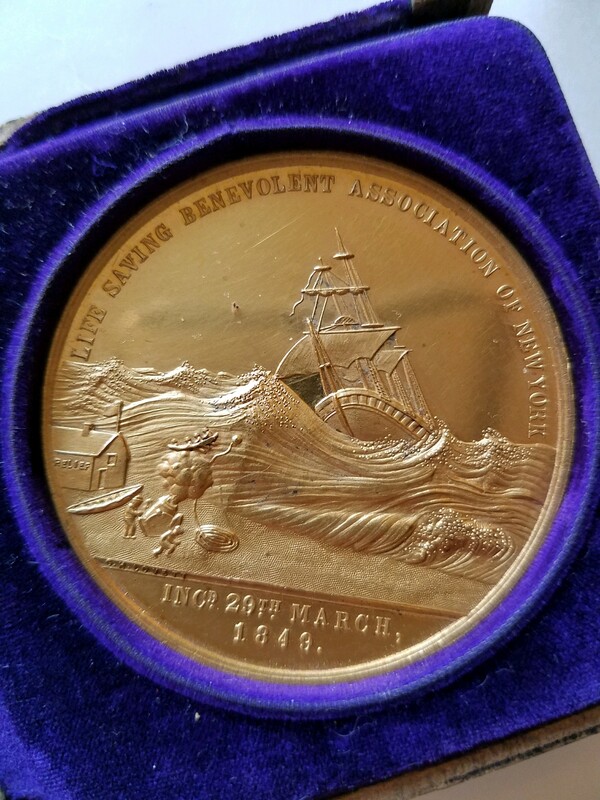 Artifacts in the Shipwreck Chapel exhibit includes the gold lifesaving medal awarded to Martin Knudsen in 1893 by the Life Saving Benevolent Association of New York. It commemorates the gallant acts Captain Knudsen performed in the rescue of the crews of two schooners in October 1892: the J. R. Gillmore and the A.P. Nichols. This exhibit is made possible with help from a Joint Effort Marketing (JEM) grant from the Wisconsin Department of Tourism.